An overwhelming majority of pregnant women who visit the doctor’s office are now refusing the flu vaccine over fears it will harm their fetus. The medical community is on damage control pushing out flawed studies in an attempt to sway opinion in a losing battle for control over fetus health. 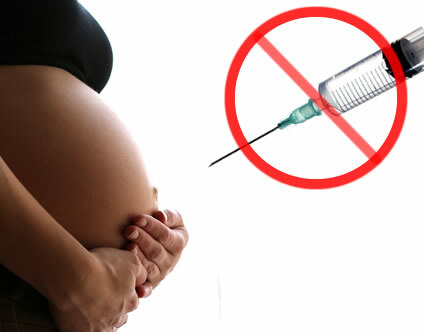 More than 90% of all expecting mothers will now say no to the flu vaccine due to fear of miscarriage and delivery of toxic byproducts to their unborn child. Getting a flu shot during pregnancy provides unanticipated risks to the baby. Specifically, one study showed that the H1N1 vaccination during the H1N1 pandemic was associated with thousands of cases of miscarriages and stillbirths which the CDC failed to inform vaccine providers. Current data from a 3-year reporting base is confirming previous reports that the majority of pregnant women are refusing influenza and other related vaccines that may jeopardize their health and that of their baby. Using the Vaccine Adverse Event Reporting System (VAERS), including updates as a second ascertainment source, capture-recapture statistical methods were used to estimate the true number of miscarriages and stillbirths following A-H1N1 flu vaccination in the U.S. Typically, even so-called “complete” studies conducted by the CDC have been shown to miss from 10% to 90% of the actual cases because of under-reporting. Pregnant women have a well-established antipathy toward vaccinations, with past averages calculating that only 15% getting the flu vaccine in any given year, compared with 30% of the general population, according to CDC reports. Moreover, pregnant women distrust medications in general — even though conventional medicine insists that flu vaccines could prevent or mitigate infection should they be exposed. “Pregnant women have an incredibly strong maternal instinct and they will not submit their child to anything that could even possibly be of harm,” said midwife Naomi Kates. A sizable portion of reproductive-age women in Los Angeles are not convinced of the value of any type of vaccine, said Dr. James Moran, chairman of obstetrics and gynecology at Saint John’s Health Center in Santa Monica. Yet, despite established evidence of miscarriages, recent conflicting studies such as the recent one from Ottawa Hospital Research Institute (OHRI) and funded by the Canadian Institutes of Health Research (CIHR), showed that compared to pregnant women who were not vaccinated against H1N1, mothers who received the H1N1 vaccination were 34% less likely to have a stillbirth. The study also found no increase in adverse outcomes for H1N1-vaccinated mothers and their babies during the weeks before and just after birth. Pfizer Canada also provides unrestricted grants to the Canadian Coalition for Immunization Awareness & Promotion (CCIAP), a merger of the Canadian Immunization Awareness Program (CIAP) and the Canadian Coalition for Influenza Immunization (CCII). Bertoucci said the study only used from Ontario’s birth record database and did not include miscarriages or even one dataset from any vaccine adverse event reporting systems which would have dramatically skewed the results of the study. A GP in Kensington said he encountered “considerable skepticism” from pregnant women. And Dr Sharon Shmueli, a GP in Swindon, said fewer than 25 percent of pregnant patients at her practice had chosen to be vaccinated. Officials typically propel pregnant women and their unborn children near the top of the priority list for vaccinations. The decision is mostly attributed by unreliable and unsubstantiated statistics which suggest that pregnant women have suffered and died from flu at disproportionately higher rates. Moreover, very little if any information from medical reports reveals and rules out other health problems in each case.